Organised by Centre for Global Equality (Cambridge) in Bahir Dar, Ethiopia, the ARB attended a workshop on Connectivity in Ethiopia where it contributed in the discussions of developing a vision for Bahr Dar to become the centre of the vision to connect “99% of Ethiopia in 10 years”. Community Networks have been considered as being a solution to connect those areas where operators won’t be going. The ARB in collaboration with APC, Article 19, KictaNET, Rhizomatica, Mozilla and TunapandaNET provided formal input to the NBS public consultations on issues related to Community Networks, Encryption and IoT security. The NBS committee confirmed receipt and acceptance of the contributions at a formal workshop held on 20 March 2019. The ARB attended the Prague IETF 104 meeting where it co-organized the IETF@Regions meeting and participated in the IETF Policy meeting. The staff supported the IETF Policy and Technical fellows and met with various IETF people who can contribute to the Africa IETF initiative. The meeting was also an opportunity to make a presentation on the development of peering and interconnection in Africa. 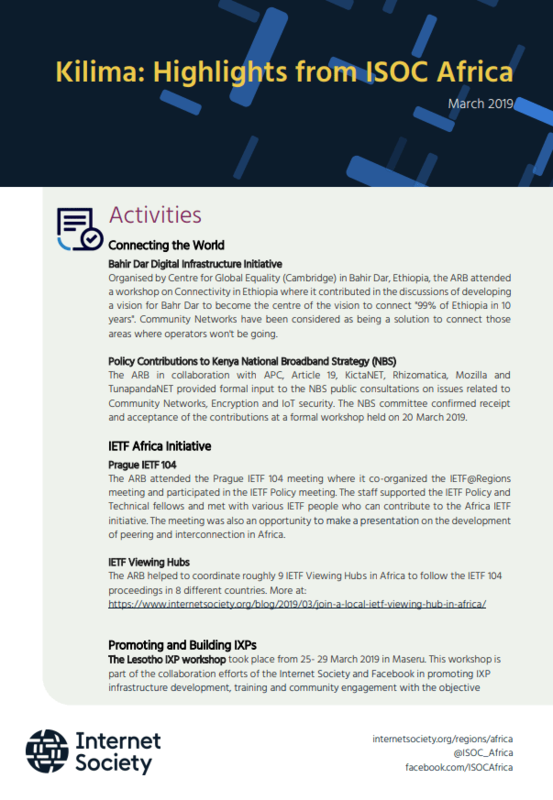 The ARB helped to coordinate roughly 9 IETF Viewing Hubs in Africa to follow the IETF 104 proceedings in 8 different countries. Read more here. The Lesotho IXP workshop took place from 25- 29 March 2019 in Maseru. This workshop is part of the collaboration efforts of the Internet Society and Facebook in promoting IXP infrastructure development, training and community engagement with the objective of increasing the number of IXPs and supporting the expansion of existing IXPs to meet the growing demand in Africa. Registered more than 500 trainees for the Introduction to Network Operations Course in English and more than 400 trainees for the Introduction to Network Operations Course in French for a training that will run from 1 April- 6 May 2019. ISOC Lesotho Chapter: The Internet Society welcomes a new chartered chapter in the Kingdom of Lesotho. ISOC Lesotho Chapter is the 36th chapter in Africa and is led by young and talented tech women. Read more. ISOC Benin Chapter: The Internet Society congratulates the chapter as it celebrates its 20th anniversary. On 3 March ISOC Benin chapter partnered with ICANN to organized an awareness workshop on Internationalized Domain Names and Universal Acceptance. On 30 March, the chapter also launched a series of town hall meetings to discuss Internet Development and Digital Economy in Benin. ISOC Ghana Chapter: Partnered with ICANN and organized on 12 March a roundtable discussion on Internationalized Domain Names and Universal Acceptance. ISOC DRC Chapter: Organized on 23 March a conference to discuss opportunities and challenges of IoT usage in Medicine. The chapter took the opportunity to talk about ISOC IoT Security Campaign and the “IoT Trust by Design” framework. ISOC Nigeria Chapter: Successfully hosted an awareness webinar on Community Networks and how they can be used to provide sustainable access to the unconnected. The ARB provided a keynote presentation to members of the Chapter on Community Networks and how to support their development in the community. ISOC African Regional Bureau: Hosted the Q1 Community Calls with African chapters and individual members. The call focused on the presentation of the ISOC’s 2019 action plan and how it translates into initiatives, projects and activities in Africa. The call was also an opportunity to present to the African community the Global Internet Report 2019 and ISOC’s ongoing work on “Consolidation in the Internet Economy”.